Unreasonable: Going forward with or without the bucks. Unreasonable: Realizing that things are changing so rapidly that planning ahead becomes useless. Reasonable: Wait until after the holidays. Unreasonable: Everyday is a holiday if you’re pursuing your dream. Reasonable: Never invest more than you’re willing to lose. Unreasonable: Invest “all of it” in yourself. Reasonable: Fabricate a great story to tell fans, followers & customers. Reasonable: Stop while you’re ahead. 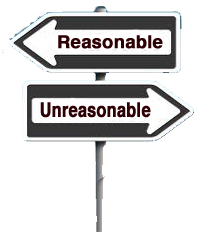 Unreasonable: “Ahead” isn’t far enough. Never stop. Really unreasonable: They built train tracks over the alps before there was ever a train to make the trip! Are you a reasonable Artrepreneur?